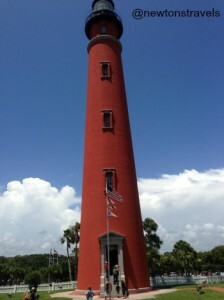 Last month when we vacationed in Ormond Beach, FL, we went with our friends to the Ponce Inlet lighthouse. It was really beautiful. I have been having some foot issues so I was not able to walk up the lighthouse but Kev and one of our friends did. They said the view was fabulous once they made it up 203 steps. I imagine 175 feet high would give you an amazing view. They could see Ponce Inlet beach and all the waterways. And while they were up in the lighthouse, we got the privilege of meeting the lighthouse keeper. He kindly took pictures with me. It was fun! It’s the tallest light house in the state of Florida and also one of the tallest in the country. 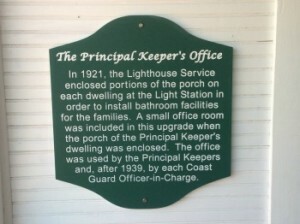 They have museum buildings like the Lens Exhibit, Principle Keeper’s Dwelling, Generator Building and more on the property. You can sign up for various tours, they have educational youth programs and special events like Climb to the Moon and Climb with the Keepers. Check it out if you’re ever near Orlando or Daytona. We absolutely loved their gift shop. It had a ton of lighthouse and nautical themed items. We bought a framed print for the home office, some beautiful jewelry for myself and a few other goodies. We were impressed with their affordable prices. Definitely go shopping there. And their customer service? Top notch. Don’t forget to follow us on Twitter and Facebook for all future travel updates. I’ll be working on adding vacation pictures to albums on our Facebook page after I return from a business trip in 2 weeks. Have you ever been to the Ponce Inlet Lighthouse?